The SAMSUNG SF-565PR laser will get you through the day. A powerful G3 33.6 kbps modem sends your faxes out at a rate of just 3 seconds per page with copy speeds of up to 17 cpm. You'll also enjoy scanning capabilities you can digitize and quickly print or fax all from a single compact machine. Powerful G3 33.6 kbps modem for fast 3-second transmission speed. The SF-565 lets you schedule large faxes to be sent during off-hours, when toll charges are less. Copy at 300 dpi at speeds up to 17 ppm. You can also resize documents from 50% ~ 200% of your original. 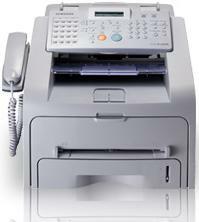 Fax to several locations, forward incoming faxes to your hotel, set a password to receive incoming faxes and more. Even if the power goes down, you can still receive and store fax data for up to 96 hours. 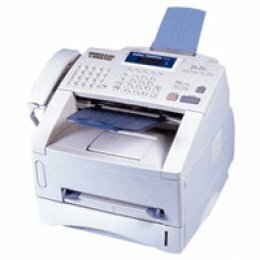 The SF-565 increases your versatility by adding the ability to digitize documents, then fax or print them.